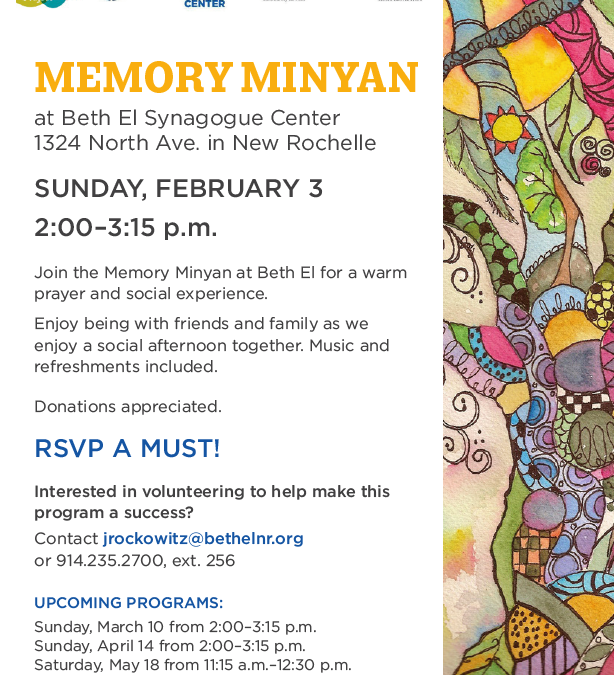 Join Seivah, WJCS and BEth El Synagogue Center at our first Memory Minyan of the new secular year. ‘Minyan’ (מִנְיָן) means “quorum.” Just as baseball is best played with nine on a team, Jewish tradition requires a minyan of ten adult (in some communities, male) Jews to be present for certain prayers to be said. “Memory” in this case means deep memory, the melodies and chants and kitchen smells familiar from childhood. The memory minyan was a meditative, melodic, joyous Shabbat evening service, followed by a traditional meal, all tailored to a minyan of people with dementia and their loved ones. Of course, plenty of nursing homes hold Shabbat services, making sure that the liturgy and message are accessible to people with dementia and other cognitive impairments. What was special about the Memory Minyan is that it actually happened in a synagogue, with other members of the synagogue. Not only would the Memory Minyan give people with dementia a chance for communal prayer; it also would be an occasion for others from the community to reconnect with old friends whom they used to see there. Not only had we had given people with dementia an opportunity to pray in their old synagogue; we had thrown a reunion party for them and their old friends.